What Is Cardiac Catheterization? Cardiac catheterization is a medical action designed to determine the condition of your heart health. This procedure is usually done to evaluate the health condition of patients who often experience chest pain. Beware of pain in the chest area may be a symptom of coronary heart disease. In addition to chest pain, there are many reasons why doctors will perform cardiac catheterization in patients. Checking blood and oxygen flow in different parts of your heart. Assess the strength of the heart muscle pumping blood throughout the body. See how well the heart valve performs. Plan the right treatment. Particularly if you just recover from a heart attack but still feel chest pain, have a test result that shows that you have heart disease, or you have a heart attack that causes the heart to be severely damaged. Correcting a defective heart with minor surgery. Take a heart muscle sample to see if you have a heart or tumor infection. This procedure can be used to check for congenital heart defects in children. 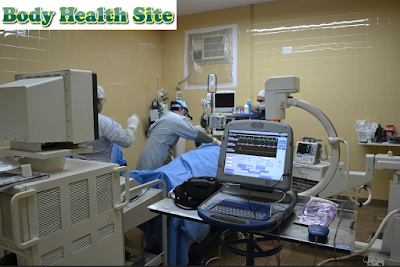 During cardiac catheterization, you will remain conscious and be able to follow all directions from the doctor. Even so, you will not be afraid because the medical team will inject a sedative drug that is soothing. The cleaning and feathering process of the area to be inserted catheter (thin and flexible tube) was performed. Once cleansed, your doctor will inject local anesthetics so that you do not feel pain when catheterization is done. The catheterization process begins by making a small hole in the blood vessels, followed by the mounting of the tube in the hole to keep the opening of the mouth of the hole. Then, the doctor will insert the guide wire from the vein hole into the heart chamber. After that, a flexible tube (catheter) is inserted following the guide wire into the blood vessels to the heart. Then the guide wire is removed again, just a catheter. When inside, the doctor will insert the contrast agent into the catheter, so the monitor will record the condition of your heart that is visible from the journey of contrast substances in the blood vessels. The results of this recording will appear on the screen of the operating room monitor so that allows doctors to see the state of your heart. Finally, the doctor may begin to perform tests, medications, or any other medical activities related to your condition. During cardiac catheterization, the doctor may also perform a coronary angiogram. This procedure is performed to determine if you have a coronary artery impairment or not. After the cardiac catheterization process is complete, you will be taken to the recovery room for several hours. While in this room, you are required to sleep on your back with the condition of straight legs and should not get out of bed. The medical team will then close the catheterization hole area to stop the bleeding. Your heart rate, pulse, and blood pressure will also be examined carefully. Damage to the arteries and heart tissue. If you are referred for cardiac catheterization by a doctor, prepare yourself as well as possible. Typically, you will be told not to consume anything at least six hours before the procedure. If you are taking any medications, consult the doctor. Tell your doctor if you have any allergies to drugs or substances to prevent unwanted things when and after cardiac catheterization. 0 Response to "What Is Cardiac Catheterization?"